Chem-Aqua® is a unique combination of knowledge, experience and stability. We specialize in providing custom designed water treatment programs for boiler, cooling, and process water systems. We help our customers minimize their energy, water, and maintenance costs while ensuring safe and reliable operation of these critical systems. Chem-Aqua has the expertise and commitment to help solve virtually any water related problem. We maintain modern, well-equipped analytical laboratories and cutting edge research facilities. Our state-of-the-art products are manufactured to rigorous ISO 9001 specifications. Our field representatives are well trained and backed by some of the most experienced water treatment specialists in the business. Our Total System Approach allows us to provide custom water treatment solutions that will make a bottom line difference to your operation. Water treatment is an important part of the preventative maintenance program for boiler, cooling, and process water systems. 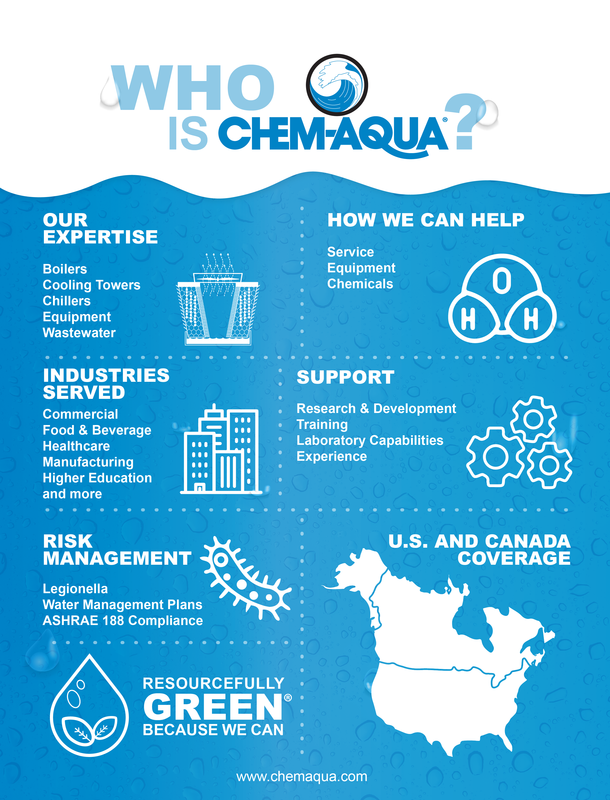 Chem-Aqua provides water treatment solutions that protect these critical systems and lower the total cost of operation. A custom-designed water treatment program from Chem-Aqua can significantly reduce your energy, water, and maintenance costs while ensuring safe and reliable operation. Even small reductions in boiler or chiller efficiency will translate into huge increases in operating costs. For example, a mere 0.0312” of scale in a 1000 HP boiler can increase annual fuel costs by over $80,000! A mere 0.005” of microbiological fouling in a 1000 ton chiller can increase annual electricity costs by $50,000. Whether the system is being used for comfort heating and cooling or for a critical industrial process, reliable operation is crucial. The high operating and maintenance costs of a poorly treated system are quickly dwarfed by the cost of production losses or an unexpected system shutdown. Waterside problems can result in unsafe operating conditions that represent a major financial liability. An effective Chem-Aqua water treatment program will help keep your boilers and chillers clean, and minimize energy, water, and maintenance costs. If you factor in the other benefits that are provided by effective water treatment such as safety, reliable operation, and extended equipment life, it should be clear that purchasing water treatment services on the basis of the chemical cost alone is very short sighted. A custom-designed Chem-Aqua water treatment solution provides value that far exceeds the cost!